It was an amazing day when my "Greatest Generation" farming grandfather bough, *gasp* a DATSUN pickup! Nowadays I guess it's "Case IH," which just isn't the same at all. 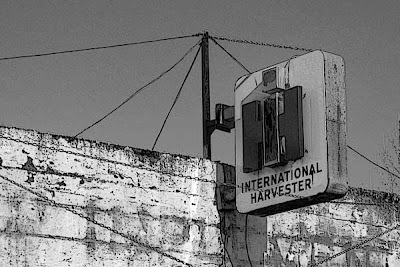 My dad worked for IH back in the 50s and 60s in Conrad. We moved there from Glendive and I loved it, both for the fields of wheat as far as you could see and the great mountains blue on the horizon. I found some old slides (1957 or 8)of IH equipment uin the field so I'll try and post them sometime on my blog. I loved it there; the light was incredible. You're right about the light in that part of the world ... but there are so many things that make that Golden Triangle area evocative and beautiful. A lot of them are subtle enough that most people don't notice, though, which is really too bad. Most of all I miss the silence. No industrial hum, just silence, enough to hear one's own heartbeat and the barley stirring in the breeze. The kind of place that moves at its own pace, where one puts down deep roots. Silence and light and the smell of dried grasses and sweet-clover, sometimes a scent of willow from the river, and lightning. Eating cactus-flower-petals out on the prairie, playing frisbee with old dried up cow-patties, watching the sun go down behind an impossibly green wheat-field, dreaming in the cottonwoods by a river...Friends from other places couldn't understand the subtlety of silence and openness. They thought it was boring and flat. God, I miss it.